Look/feel/sound familiar? The knee is like any other joint – complex! There’s a lot that can go wrong with it. I’m talking troublesome tendons, patella tendons in particular. I recently attended a tendinopathy weekend with the excellent Jill Cook (tendon Guru extraordinaire) and her team, who lectured to a select group of clinicians the latest evidence based practice in tendinopathy management. 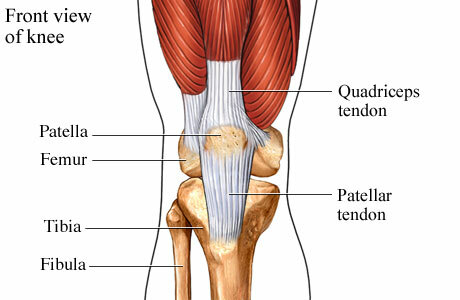 So I thought I would share that knowledge with you and then focus a wee bit more on the patella tendon. Back in the days we assumed that tendons went through a stage of inflammation like any other tissue. Inflammation being a contributing factor to pain, swelling, loss of function etc. A structure with inflammation would be referred to as having an itis, so tendinitis was accepted as inflammation of the tendon. Studies of problem tendons during surgery has shown that no inflammatory markers exist, therefore tendinitis was rendered obsolete and the term tendinopathy (pathology of the tendon) is now accepted. The knee joint is made up of the tibia and femur (tibio-femoral joint) and the patella and femur (patella-femoral joint) Surrounded by a capsule the tibio-femoral joint contains a series of ligaments and menisci that act to provide stability and cushioning to the knee joint. Surrounding the tibio-femoral joint are two collateral ligaments, a fatpad, several bursa, tendons, muscle, plicae/retinacular structures and the patella-femoral joint, all innervated by nerves. The patella tendon connects the patella to the tibial tuberosity. Tendon make up is complex, imagine a packet of dry spaghetti if you will, tendon structure is comprised of water and collagen fibres that are tightly packed together in a linear fashion monitored by clever cells called tenocytes. Tenocytes communicate with each other informing the tendon about it’s structure and the changes in load. Tendons being load bearing structures are very reactive to change. So when an increase in activity occurs tenocytes accumulate within the tendon resulting in an increase in a sugary molecule called a glycosaminoglycan or GAG. GAGs are highly polar and will attract water rapidly causing the tendon to swell. This can happen over a period of 24/48 hours. Therefore an individual that is inactive and decides to take up a sport with lots of impact will increase the load on the tendon resulting in a reactive change, causing swelling and give rise to pain. Active individuals are also not exempt from this as a change in footwear, terrain and movement patterns can change the load impact on a tendon. The tendon can go through various states and combinations on a pathological continuum from an under-loaded tendon/normal tendon to a reactive state, disrepair state and/or a degenerative state (reference). The tendon can be exposed to a combination of these states and not all parts of the tendon can be affected. Overtime and with continued exposure to high load structural changes in the tendon can occur. Remember the dried spaghetti well parts of the tendon can begin to adopt more of a boiled spaghetti appearance. Not literally! Just more disorganized rather than linear. Once the affected parts of a tendon are in a degenerative state there is little chance of reversibility compared to the other two states. However, irrespective of the degenerative state there is still opportunity to increase the tendons load tolerance. The diagram below shows a blue area and a red area. The blue area can be represented as a degenerative part of the tendon, the red showing healthy tendon. Through training the tendon in the right way can increase the tensile strength of the healthy tendon. This is a continual area of tendinopathy research and there appears to be a difference in pain associated with tendinopathy. An acute bout of Pain tends to be localised to the tendon, it’s tender when you touch it, pain is more load related and it tends to go away with rest. Pain that is persistent can give rise to other contributing factors such as increase in nervous system sensitivity or potential referred pain. This is an area of ongoing research. Interestingly, where it is accepted that pain in tendons are related to tendon loading, tendons can be badly degenerated but give no rise to pain thus currently the nociceptive (clever little mutli-modal nerve) driver remains unknown (reference) . What has been shown to be efficacious is that after brief periods (60 secs) of isometric loading pain reduced significantly (reference). 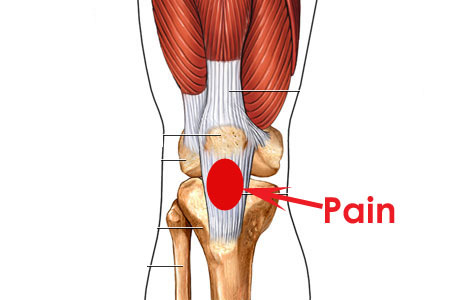 Patella tendinopathy is a complex injury and can very easily be misdiagnosed. I highlight here that if you suspect that you may have a tendon injury it is important to consult a physiotherapist sooner than later. Asking the history behind the onset of symptoms are important to correct diagnosis. History of onset would include a sudden change in activity levels for example taking up running or starting a high activity sport, or perhaps your are an active individual and you have increased your training levels. Load related tasks would be provocative of symptoms such as walking downstairs. Pain would be localized and specific in contrast to a diffuse area of pain which could give rise to other pathologies of the knee. Pain over a 24-48 hour period would also be indicative particularly if the tendon is painful the next day after overload. Night pain is uncommon. Finally, prolonged positions such as sitting is also a sign that the tendon may be implicated. There are additional factors such as body typing, gender, age, biomechanics contributing to tendinopathy (reference) and co-morbidites including diabetes and obesity, which have shown to have an effect on tendon morphology (reference, reference). A lot of research has been conducted into best practice for tendon rehabilitation. A multitude of treatment from manual therapy, injection and surgical interventions, shockwave therapy have mixed outcomes (reference). Touching briefly on injections there are a multitude of different types of stuff that can be injected into your tendons and I would always air on the side of caution. The evidence is lacking at best and damning at worst. You may hear or read on Dr Google about the great effects prolotherapy or sclerosing therapy, plasma rich protein, corticosteroid, autologous injections blah blah! Most of these injections are neurotoxic therefore having an effect on pain (reference, reference, reference). This does not treat the underlying cause!! Tendon’s are load tolerating structures and with a sudden rapid change in load, a reactive response can occur. Therefore the evidence suggests that when a reactive change occurs relative rest is required and a reduction in high load exposure. It is important to explain that resting for 2 weeks like your GP might advise and then going back to your sport/activity that caused the initial problem is not the best idea! What I would potentially recommend is getting NSAIDs (ibuprofen) from your GP as they have been shown to reduce cell accumulation and may be beneficial to help settle a reactive tendon, but then the buck stops there. 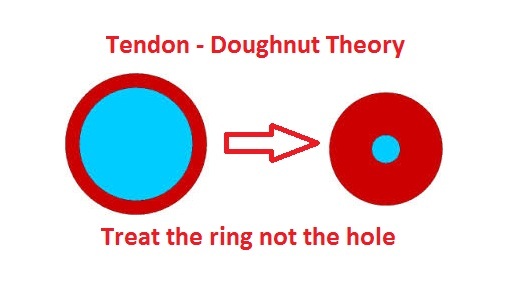 In order to increase the tendon strength and get back to your activity a gradual reintroduction in load tolerance starting with isometric load (pain relieving) and building to isotonic (concentric/eccentric) and plyometric exercises (remember the doughnut theory?) is recommended. A tailored exercise program combined with education that is goal specific (SMART) provides a specialized and structured approach to returning to your chosen activity . In terms of the loading the tendon needs to be able to handle your entire body weight. When we run for example we are only on one leg at any one time. So building up the tendon load strength is important. Being able to lift 1.5x your body weight repetitively is a good rule of thumb. However an isometric contraction and running are two very different types of muscle contraction and very different types of load for the tendon. Therefore you need to condition the tendon gradually be able to do this. Lets look at each of the types of contraction . An isometric contraction is when the muscle/tendon complex is under contraction but does not change in length. A concentric contraction is when the muscle complex shortens under contraction. An eccentric contraction is when the muscle complex lengthens under contraction. A combination of all three with energy storage makes up a plyometric exercise. See the video for all three. I aim to add a series of exercises for patella tendinopathy on the nakedphysio in the next couple of weeks showing a progressive exercise plan that will consist of each contraction. There you have it a wee summary of tendons and their management. There is a lot that can go wrong with a knee, patella tendinopathy is a common pathology. My advice is to take action when you feel any acute bout of pain as described above. Taking the approach of ‘ach it’ll be ok I’ll just rest it’ or ‘i’ll just run it off’ is not advised as it can lead to further complications! Thanks for having a read. Do you have any comments, thoughts or opinions? P.S. New evidence!!!! – Recent evidence has suggested that inflammation may be present after all in tendinopathies in the early overload (reactive) response phase and in chronic tendinopathy. However this does not refer clinical thinking back to the old term tendinitis, it is more complex than that with other pathological components involved (reference). 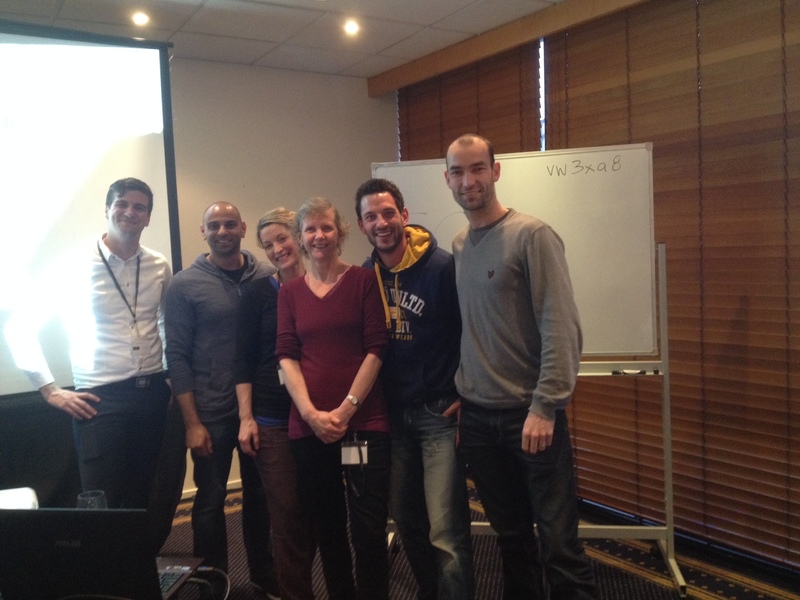 Thanks to Jill Cook and team for a very comprehensive and interesting weekend of talking it up about tendons! !